Selenium is a crucial element in the diet of animals. It works in conjunction with vitamin E in relation to a variety of important bodily needs, like preventing and repairing cell damage, supporting growth and fertility, and is involved in immune functions. When ewes and lambs aren’t able to get enough selenium or vitamin E in their diets, they can become selenium deficient. Selenium deficiency can result in poor growth in lambs, weaner ill thrift, white muscle disease, reduced wool production and reduced ewe fertility. Certain geographic areas of Australia are predisposed to selenium or vitamin E deficiency due to levels of rainfall; vitamin E concentrations in green crops fall rapidly in drought conditions whereas an over-abundance of green feed can lead to low levels of selenium. 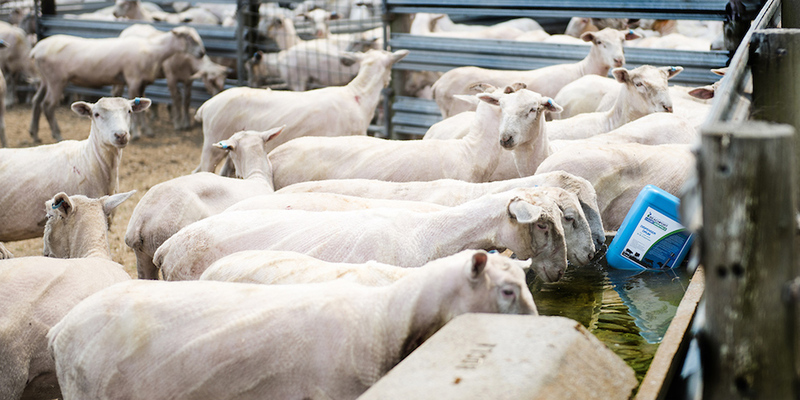 Selenium deficiency can significantly affect the health and wool production of your flock. Find out more about the causes and treatments available by reading on. What causes selenium deficiency in sheep? Generally speaking, there are four factors that could indicate that your flock are predisposed to selenium deficiency. Different areas of Australia may experience varying severity or likelihood of different symptoms depending on which of the factors affect their region. Acidic basalt or granite soils and sandy soils, an annual rainfall in the area over 450mm, clover dominant pastures, or heavy fertiliser application (more so if the fertiliser is sulfur-fortified superphosphate or gypsum) can all contribute to a flock that exhibits the symptoms of selenium deficiency. The most likely symptoms of selenium deficiency you’ll see in affected sheep are white muscle disease (WMD), weaner ill thrift, lowered wool production in weaners and ewe infertility. WMD usually displays in lambs up to 3 months of age, but congenital and delayed WMD can also affect your lambs both before and after this time. Affected lambs suffer muscle trembles and may walk with a stiff gait or arched back. They will usually die within a few days of displaying symptoms of the disease. Before treating your flock for selenium deficiency, it’s important to be sure of the diagnosis. Many different diseases can have similar symptoms to selenium deficiency, and an excess of the element can be toxic. Accurate diagnosis may require blood samples, so it’s best to speak with your veterinarian before embarking on a treatment plan. Dramatic improvements can be seen after successful supplementation, so if you’ve received confirmation that selenium deficiency is definitely to blame for the problems you’re seeing, it’s time to look into supplementation methods. Some normal merino lambs may also respond to added selenium with increased growth rates and wool production. There is a range of methods available, including in-feed medication, periodic drenching, injection, bolus’ or pellets. Supplementing your flock through their water supply is simple, cost-effective and helps to ensure that all animals are accessing the added nutrients. Our BLM Blue Cap liquid supplement is our base product and includes the benefits of added selenium, as well as other trace elements, amino acids and electrolytes to help improve the performance of your flock. While helping to increase the selenium levels in your flock’s diet, it also aids in improving the retention rate and correcting other essential mineral deficiencies. If you’re already supplementing your flock with selenium, our BLM Black Cap product is selenium-free while still retaining the other natural ingredients. It allows you to add trace elements, amino acids and electrolytes to help improve the health of your flock without running the risk of oversaturating them with selenium. Read more about the benefits of our Black Cap and Blue Cap products to see how adding our 3-in-1 formulation could help improve the performance of your flock. Beachport Liquid Minerals cannot be orally dosed due to APVMA compliance regulations.